First of all a clarification: "LEGO" is a trade mark of the LEGO Group in Billund, Denmark. This website is neither sponsored nor authorised nor supported by the LEGO Group. The videos show LEGO bricks that have been washed in a washing machine at 30 degree Celsius - without washing powder and without speedspinning at the end. The films were made by a waterproof camera which was also inside the washing machine. 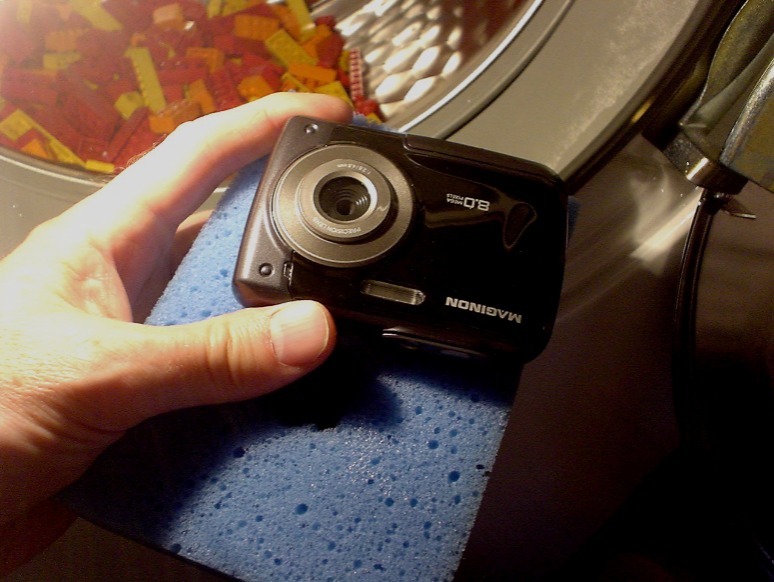 The cam was bolstered by a sponge. The two videos are formatted in wmv. 57 seconds; ca 8.0 MB. 30 seconds; ca 3.4 MB. Most of all I like the plunge cascades in the seconds 8, 10, and 14. In seconds 21 and 22 a few bricks are bond to the ceiling of the washing drum. Some of the technical background is explained on this website with some test videos.